It's open. After months of watching the site morph from a cakeshop; to building shell; to a roofed, walled space filled with light, tiles and little else; then in a mad rush this week gain chairs, tables, shelves, wine bottles, decorations, tills and all the accoutrements of the restaurant world, finally, finally, we have George Calombaris' new venture, Hellenic Republic. Rather than the plush, darkened, reverential dinner environs of the Press Club, this is a space open on two sides to an abundance of light, offering lunch and dinner during the week with the addition of brunch on the weekends. This is the sort of place where one glass of wine is rarely enough. Stepping inside does not quite equate to entering a portal to the Aegean coast, although if you answered to the name of Onassis and enjoyed cruising the Greek isles in boat shoes and linen trousers you'd complement the design well. 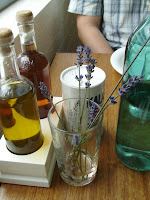 Pine and marble alternate on the table tops; the chair seats are roped, as are the tops of the Mediterranean-blue water bottles (and tap water arrives immediately, although the bottled variety is also available). White tiles and white-painted brick are juxtaposed by judicious splashes of navy, for example on the banquette seats on the back wall. 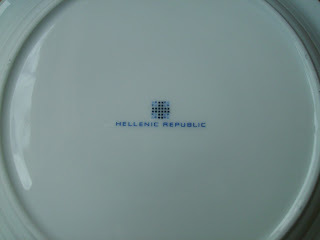 Navy squares also feature in the logo, subtly stamped on the crockery and waitstaff's police-officer-style uniforms. A communal, mosaiced table sits in the front window, next to a huge armoire jumbled with Greek produce and drawer after drawer of spices. Enough of the interior...what about the food? A brunch selection is served 8am-4pm Saturday and Sunday, with lunch kicking in after 12pm. Dividing the two is a meze plate of beetroot in cumin, green peppers, kalimatas, marinated grilled octopus and fried greens ($18.50). Breakfast could be as refreshing as watermelon, almond and feta salad; or as hangover-shaking as the 'lamb ham sandwich', which comes on Dench ciabatta (the bread of choice throughout the menu), with just the former meat, cured to taste like the latter, and a fried egg. The breakfast omelette looks to Spain, featuring slices of al dente potatoes, but returns to Hellas with chunks of loukaniko, a Cypriot pork sausage, embedded along with the spuds. 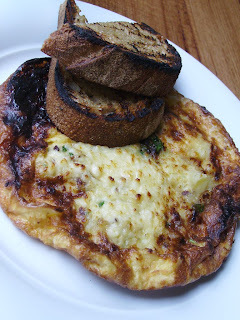 Halloumi is melted in with the eggs for extra texture. Surprisingly, the dish is not overly salty, and while it wasn't mind-blowing during the eating, it was undoubtedly satisfying. It comes with two oiled slices of Dench sourdough (in this case strategically placed over a quadrant that got a little too close to the grill!). Lunch offerings include moussaka, done according to Calombaris' yia yia's recipe; fish of the day, served with chips wrapped in a paper basket; and braised pork (most of which are also available on the dinner menu). And, of course, there is lamb. A glassed and walled area at the back of the restaurant houses the spit, where many a young ovine is destined to be expertly turned over the coals, producing pungent, sweet, tender meat. 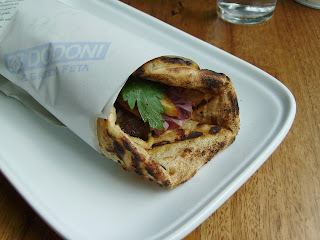 The lunch souvlaki is a reprise of the Press Club dish from Taste of Melbourne. Slices of the succulent meat are wrapped in a crisped pita, which is also smeared with mustard and daubed with onion and parsley. Want chips with that? They're right there, wrapped in with the meat. At $14.50, and on the smaller side of huge, I say order two and have done with it, because you'll be sorry when it's finished. Or, maybe you'd rather save room for something sweet. Dessert offers baklava, rice pudding and galaktaboureko, a dish similar to baklava, but with custard - in this case semolina - instead of nuts between pastry and drizzled with sugar syrup. 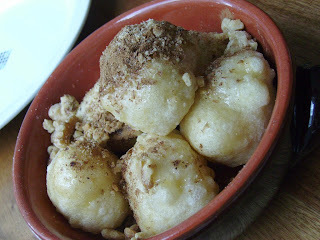 We were verbally offered loukamades (Greek doughnuts drizzled with walnuts and honey), but when our waiter realised they were part of the dinner rather than lunch menu, SG's hopes were dashed and we settled on galaktaboureko between us. But it wasn't ready yet (ie it's made fresh daily), whereas the loukamades were! A win-win situation, and other than from a long wait for drinks, the only hiccup on Day 2 of the restaurant's existence. The wine menu is succinct, but hugely respectful of Greek varietals, and is kept short to keep it to wines that fit the food. The dinner menu features a page of share plates - prawns by the piece, vine leaves etc - and two banquet options, alpha and beta ($50 and $60 respectively). An insert in the menu is a perfect demonstration of Calombaris' respect for his diners: the fishmonger arrives daily and they then decide and price the menu accordingly, printing it anew each day. This is an exciting place to dine. Some of the staff from the Press Club have headed north to man the floor, and while the floor staff may not always be in such abundance as initially (there were at least 10) they're already comfortable with the menu and keep diners feeling the same way. It's definitely more approachable on a budget than the Press Club or its sister bar, and a midday weekend meal is a particularly good way to nibble affordably off the menu. It will be interesting to find out if that relaxed atmosphere is maintained for dinner - certainly the decor and lighting intend it to - something we'll ascertain as soon as we can get a seat! I walked past last night and I said I would be sure to check it out. You have only pushed that further. we have a reservation for this coming saturday. so far i've only heard good reports. can't wait! I'm excited on your behalf! We tried to get back in for dinner this week but had to settle for the waitlist. I'd love to hear what you think of it. We went last night, got a seat at the bar. We had wonderful food, and great friendly service. The taramasalata was the best I've ever had. It's an easy walk for us so we will undoubtedly go back. The service is notably good, isn't it? Amazing! 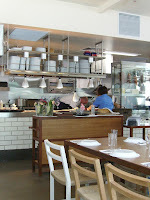 I was there last week and its the closest thing to greek cuisine here in melbourne! Not one bad thing to say. Well done George! I am very sure one day very soon, I will visit this place and have a meal.